Course 2 was another round of seafood. This time it was Dungeness Crab Cakes! 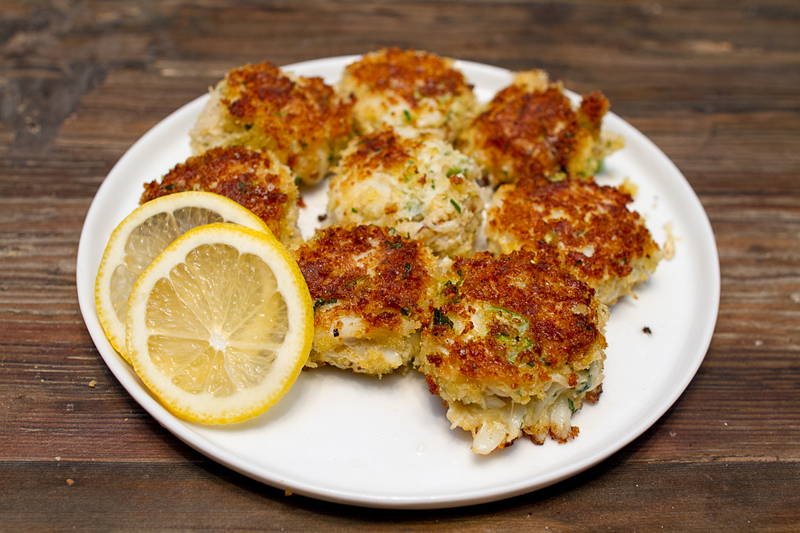 There are a million crab cake recipes on the internet, so it’s really just a matter of picking up the basics and taking a chance on things you might like. Jenn and I picked up single live crab (around $30) for this dish. Live seafood is always an adventure and when you’re making a meal like this, why not go the extra few steps. After steaming the crab, I let it cool in an ice bath so we wouldn’t be burning ourselves on hot crab meat. Once the meat was pulled, it was just a matter of mixing an egg, some herbs, diced celery, dry mustard, a touch of mayo, and panko. We rolled the cakes into balls and cooled them in the fridge until ready. Pan frying the cakes was the easiest choice, requiring just a tbsp or so of oil and a quick press of the cake in panko to help with the crust. I forget how long they were cooked for, but you’ll get the hang of it really quickly. Sprinkle them with a nice flaky salt and squeeze of lemon before devouring!